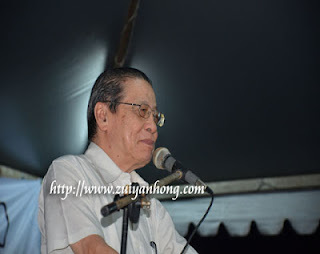 The adviser of DAP Lim Kit Siang asserted that if Pakatan Rakyat takes over Putrajaya, Pakatan Rakyat government will determine to eradicate "grand corruption" which is widespread in Malaysia. I support Lim Kit Siang in the elimination of corruption which has existed for decades. Those who work so hard to earn a living and help someone to raise cows in luxurious condominium, certainly agree with Lim Kit Siang battles against corruption. The incident of civilian died after invited for coffee reminds us to concern our right as citizens of Malaysia. So as to fulfill the wish of Lim Kit Siang as well as for the better future of ourselves, we should reject government which is not trustworthy.